Offering industry-leading defense for any network size. 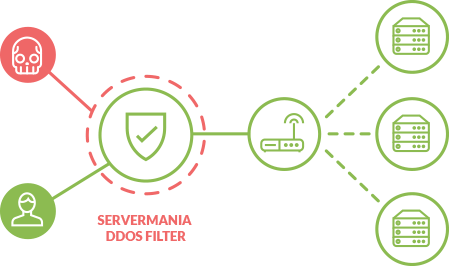 ServerMania’s DDoS Protection will instantly mitigate any DDoS attack that targets your infrastructure. Distributed Denial of Service Attacks occur every day and the effects can be devastating on any business. Don’t be caught without the right protection for your business. Speak to an expert today about the plan that is most suited for you. Protection is crucial which is why we include 5 Gbps of protection against common sized attacks. Premium offers additional coverage against moderate DDoS attacks at an affordable rate. With the majority of DDoS attacks being under 20 Gbps, this package offers optimal protection. Maximum protection for mission critical applications against large-scale DDoS attacks. Our DDoS protection uses the latest and most effective methods of detecting and dropping attack traffic. These techniques are regularly updated as DDoS attacks evolve and become more sophisticated, ensuring your business is protected at all times.